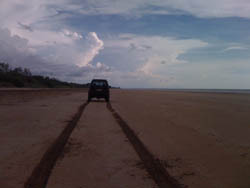 Gunn Point has some of the only beach driving available in the top end. Good solid sand mostly, wide beach at low tide, fishing, great campsites. Hill climbs behind the beach, dodge the quad bikes, or not.